22nd Century is a plant biotechnology company with an important mission: To Reduce the Harm Caused by Smoking. Our long-term focus is the research, development, licensing, manufacturing, and worldwide sales and distribution of our important products. 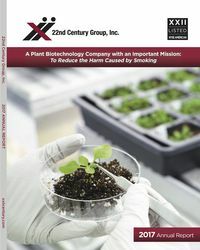 22nd Century Group's proprietary genetic engineering technology and plant breeding expertise allow us to regulate the level of nicotine in the tobacco plant. As a result of our unique technology, we are able to grow tobacco with up to 97% less nicotine than conventional tobacco - as well as plants with relatively high nicotine levels. We have an extensive intellectual property portfolio of issued patents and patent applications relating to the tobacco and cannabis plants.